You’ll find some great Fall Festival / Carnival Style games on the Birthday Party Ideas 4 Kids website. We’ve listed all of our favorite games that have been sent in by parents. Only the top games that kids loved the most have been posted on the site. The greatest thing about all of these games is that set up and supplies for all the games are easy and inexpensive. Most of the games use recycled materials making them almost free to put together! Fun do it yourself Fall Festival games. All of the games have set up instructions, directions on how to play and variations so you can customize them to what your needs are. This is the Racetrack game. 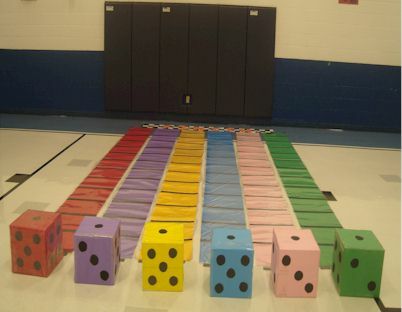 A large racetrack is used with huge dice and the players are the playing pieces that move down the racetrack. The kids really enjoy this fun game! See www.birthdaypartyideas4kids.com/carnival-games.htm for complete instructions.